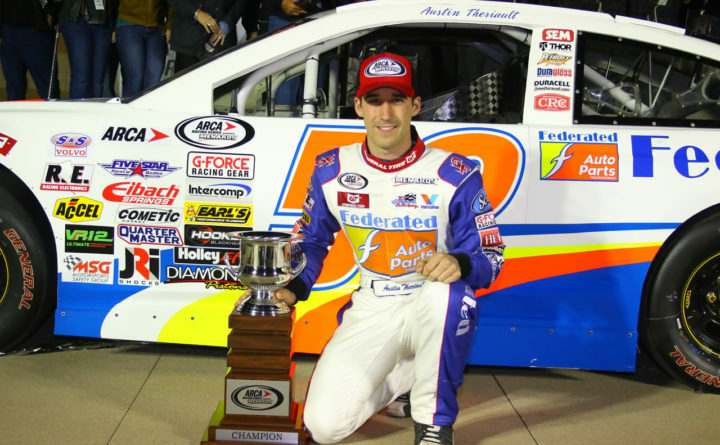 Austin Theriault poses with his trophy after winning a race during the ARCA series in 2017. The Fort Kent native returns to Maine next week to race in the Pro All Star Series North Spud 150 at his former home track, Spud Speedway in Caribou. Fort Kent native Austin Theriault finished 22nd in the TruNorth Global NASCAR 250 Gander Outdoors Truck Series race at Martinsville Speedway in Virginia on Saturday afternoon. Theriault qualified 26th in the 32-truck field and completed the race two laps down over the .526-mile short-track oval. The race was won by Monster Energy Cup driver Kyle Busch, who posted his 201st career victory among NASCAR’s three major series. Theriault has a multirace deal with Ricky Benton Racing Enterprises. Because the Benton Racing Enterprises team is running a limited schedule, Theriault doesn’t have any provisionals so he has to earn his way into the field on his qualifying time. He failed to qualify by fractions of a second for the NextERA 250 at Daytona International Speedway last month. Theriault’s next Truck Series race will be Friday, May 17, at the North Carolina Education Lottery 200 at Charlotte Motor Speedway in Concord, North Carolina. Saturday’s race was the 13th in the truck series of the 25-year-old Theriault’s career. He has five top-10 and two top-five finishes to date. He has also run six Xfinity Series races and is close to finalizing a part-time deal that would see him make his Monster Energy Cup debut sometime this year or next season. He would be the first Maine native to run in NASCAR’s top series since Newburgh’s Ricky Craven, who ran the last of his 278 Cup series races in 2004. Theriault became the first Mainer to win the ARCA Racing Series championship in 2017 when he posted a series-high seven victories, 19 top-10 and 12 top-three finishes in 20 races.